More than 4,000 animal parts, including tiger skins and rhino hides, were burned into a huge bonfire at the CNP headquarters in Kasara at a programme on Monday coinciding with International Day for Biological Diversity. According to the CNP administration, various parts of 48 species of animals were torched. Rhino horns; tiger, leopard, snow leopard, red panda and python skins; tiger claws; pangolin scales; musk deer glands; bear galls; leopard bones; elephant tail hair; tortoise scales and sea horses among others were destroyed. The stockpile included 357 rhino horns, 67 tiger skins, 418 pieces of leopard pelt and 412 parts of various animals. Ten rhino horns and five tiger skins, however, were not destroyed on Monday. Conservationists said they have been bar-coded and saved for investigation and research. Minister for Foreign Affairs Prakash Sharan Mahat set the stockpile on fire. Firewood, ghee and kerosene were used to burn the animal parts. Elephant tusks, however, are yet to be destroyed. Joint Secretary Maheshwor Dhakal said elephant tusks were not destroyed on Monday since it requires around 900 degrees Celsius of temperature to burn them. Around 1,100kg of ivory is still in storage, according to officials. 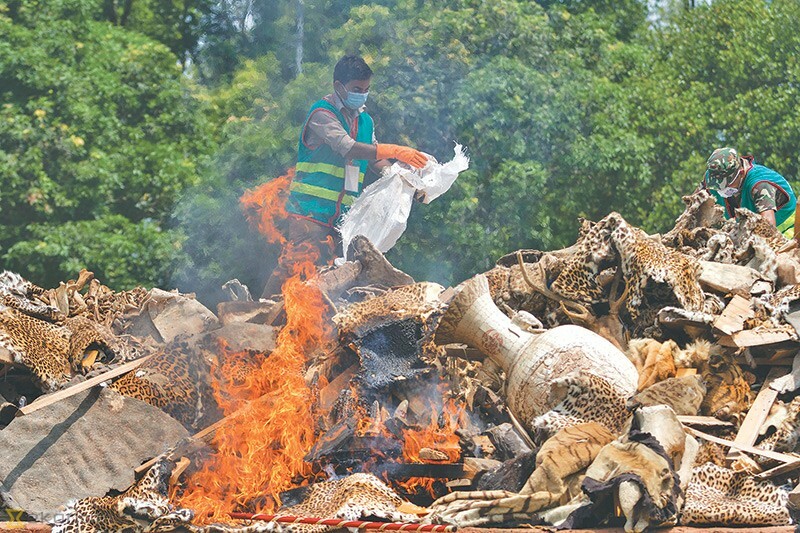 The Cabinet on Thursday had decided to destroy animal parts and skins that were stored for around two decades in order to reassert the country’s commitment against poaching and smuggling of animal parts. The last time the country destroyed animal parts and trophies was on Mach 22, 1998. Officials said there was an urgent need to destroy the animal parts as they had started to decay. On top of that, storing and security of these valuable animal parts is a huge financial burden, according to them. The animal parts that were destroyed on Monday were collected from various national parks and forests and seized from smugglers. They were stored at Tikauli-based Armed Forest Guard Training Centre and CNP headquarters in Kasara. Forest Minister Shankar Bhandari, US Ambassador Alaina B Teplitz, senior security officials, conservationists, mediapersons and locals were present at Kasara on Monday when the animal parts and skins were destroyed. We have reduced these animal parts to ashes to send across a message that these are not meant for trade, said Minister Bhandari, adding that the ashes and remains would be buried on the CNP premises where a monument will be built to signifying Nepal’s commitment against wildlife trade. US Ambassador Teplitz said that burning of these animal parts would help disseminate a message across the world against poaching. Nepal has made significant strides in combating wildlife trade in recent years. However, challenges continue to remain, with poachers often targeting rhinos and tigers in the national parks.